The Spinsterhood Diaries: Happy New Year! I'm sure you won't be surprised to find out that, at 9:42 AM, I have already been awake for more than an hour. This is when you know you're getting old and/or are a real adult. When you'd love to sleep in but you just can't. To the left you'll find a photo of the fine fellow with whom I passed into the New Year. 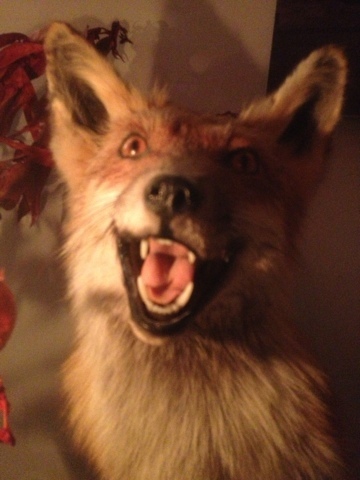 If you think he's a taxidermic fox head, you'd be correct. He sat next to me at dinner. We did not share a New Year's kiss. He had an aftermarket tongue. I've been watching The Today Show since I woke up while I perused tweets with the hashtags #spinster, #singleforlife, and #singleprobs. Twitter has been offering me a consensus-based view of how many ladies did what I considered doing last night: eating in front of the TV. Honestly, it looks like they all had a pretty good time. Instead of biting into a brownie as everyone else kissed each other, though, I enjoyed a nice dinner of Lamb Chili with my lovely Single Lady Neighbor and her Brother, his wife, and their lifelong-cross-continental best friend. And, of course, my foxy date. Sorry, I couldn't help it.